It's taken over a century, but the detour known as the Dufferin jog is finally being straightened, after years languishing on the city's wish list of improvements. Pedestrians, TTC riders and drivers passing through the eastern gateway into Parkdale might not notice much going on at the moment, but by the fall the signs of this momentous alteration to the west end streetscape will be hard to ignore. John Bryson, manager of the city's Structures and Expressways department, describes what will happen once the $40 million project, which kicked off in June, reaches its crucial phase later this fall. 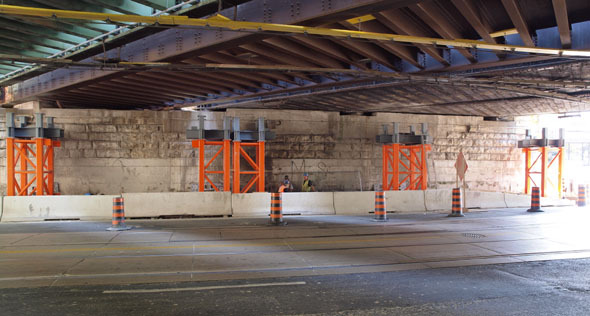 The first of a two-part process will start with the shifting of two of the four railway lines that travel over Queen on an 111-year-old landmark underpass. "The railway will shift their rail lines to the south so we can finish the north half, and we'll finish the north half with normal excavation, cast in place, and then we'll move the railway lines onto the north half and we'll start on the south half. 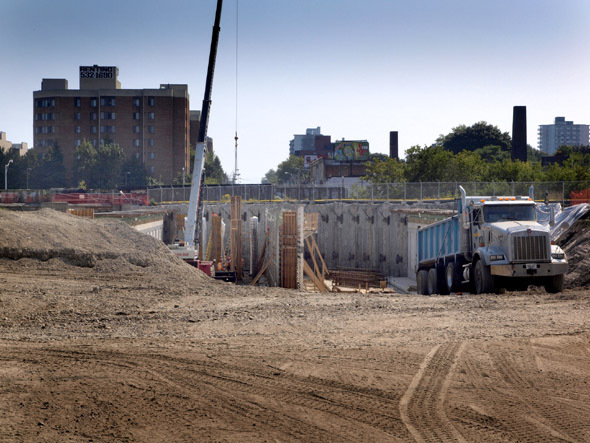 We will take out the limestone walls on Queen Street and we will be saving that limestone for another purpose, and then we will have the opening for Dufferin on Queen Street." 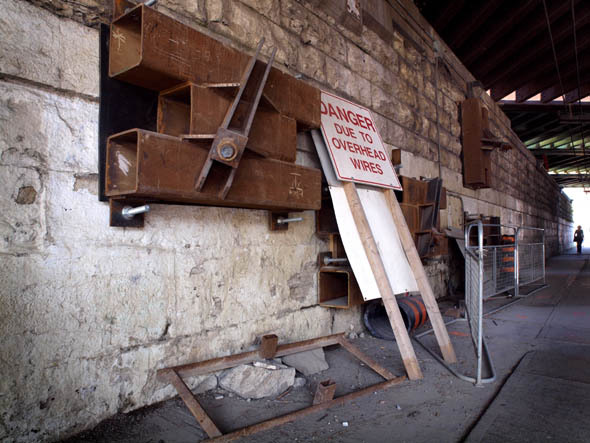 Right now, the only evidence of the work going on at the heart of the jog is a quartet of massive steel anchors screwed into the north wall of the underpass on Queen, next to where Dufferin will re-emerge, and another four steel supports positioned to help take the weight of the rail lines. Horses still traveled dirt roads when Dufferin last crossed Queen at grade, intersected by railway lines, but the construction of the Queen St. Subway in 1898 made Dufferin's dogleg detour onto Peel and Gladstone avenues and Queen a supposedly permanent part of the city landscape. In some ways, it'll be a shame to see the jog disappear, as it's one of the few remnants of the days when railways shaped the way Toronto grew. Bryson says that the underpass is in fine shape, and that the only issue so far is meeting the schedule for the vital rerouting of GO and CN trains, and that they'll probably be finished by late spring or early summer. "My suspicion is that there will be some kind of ribbon cutting ceremony mostly because next year's election year."